Vince Loschiavo was warned, but he wasn’t able to fully brace for the impact. “They told me it would go by fast. I never realized back then what they meant. 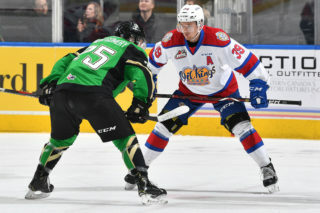 It’s been five WHL seasons and now, officially, 300 regular season games for Loschiavo, who hit the milestone marker on Tuesday, January 29, 2019 when the Edmonton Oil Kings hosted the Brandon Wheat Kings at Rogers Place. 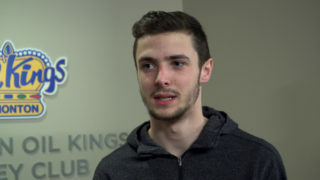 When he broke into the League as a fresh-faced 16-year-old, his veteran Kootenay ICE teammates told him to appreciate the experience, because it would be over before he knew it. But like any young, excited player with zero limitations in sight, he didn’t think much of it. Even as a young child, it was easy to see that hockey would play a major part in Vince’s future according to his mom, Alison. “As a toddler, Vince rarely played with toys,” said Alison, “just sports equipment. He was all about soccer until he was three – then he discovered hockey and it was all he cared about. “When Vince was four years old he got a pair of roller blades. He would zip around in the basement – all by himself – pretending he was in a game. “I remember once watching him having fun playing, like he always did, then he suddenly just stopped – rather abruptly – and sat on the steps. I asked him what he was doing. The Winnipeg, MB native’s WHL journey began as a member of the ICE in 2014-15. He was part of a Kootenay team that was capable of winning games – finishing the regular season with a .542 win percentage – and entered the playoffs as a legitimate threat as a potential seventh-seed spoiler with the likes of Tim Bozon, Sam Reinhart and Cale Fleury in their line-up. The chance to play with highly skilled players of that caliber was something not lost upon the young Loschiavo. That year Kootenay found themselves facing the second-seeded Calgary Hitmen in the opening round of the playoffs, and the underdog ICE went toe-to-toe with their divisional foes despite finishing 17-points back of them in the regular season standings. After taking a 1-0 series lead, the ICE dropped Games 2 and 3 in overtime – Game 3 by a devastating 8-7 final. The Hitmen skated to a 7-2 win in Game 4 to win three straight and take a 3-1 series stranglehold. But Loschiavo and the ICE refused to tap out, winning the next two games and sending the series to a Game 7 showdown. The Hitmen won the game, 6-2, and advanced to the second round of the 2015 WHL playoffs. The loss left Loschiavo and his teammates hungry for retribution, but a return to the post-season would have to wait. 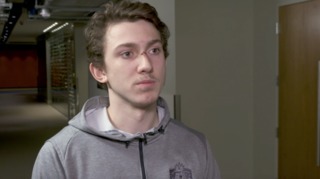 The next two years were a far cry from the success of his rookie season, as Loschiavo and the ICE would fail to qualify for post-season play in 2015-16 and 2016-17. Near mid-December of 2017, with a 13-17-2 record and having just dropped their third straight game, the ICE came to terms on an agreement to send Loschiavo to the Moose Jaw Warriors. It was a change of scenery and the start of a new chapter in his WHL career. The then-18-year-old was off to a Warriors team that would finish the regular season with a WHL best 109 points and a record of 52-15-2-3. 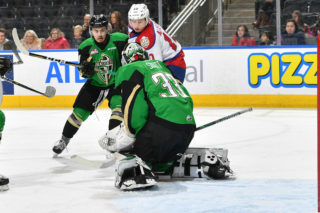 A return to the playoffs was imminent, and it was the Prince Albert Raiders who were slated as their first round opponents. After dropping Game 1, the Warriors won back-to-back games in overtime, followed by a 2-0 shutout victory, to take a 3-1 lead in the series. Visions of 2014-15 came flooding back to Loschiavo – but this time with the shoe on the other foot – as his opponents were the ones to battle back from a 3-1 deficit and force the series to a deciding Game 7. In this Game 7 though, fortunes were different for him and his teammates. The Warriors claimed a 5-4, series-clinching win and with that a berth in the second round of the WHL playoffs was not a dream, but a reality. Moose Jaw faced the Swift Current Broncos in the second round and the teams split the first two games making it a best-of-five series. Moose Jaw claimed Game 3, in overtime, 4-3. Swift Current won 3-2 in double overtime in Game 4. The Broncos blanked the Warriors, 2-0, in Game 5. Moose Jaw grinded out a 3-2 triple overtime victory the next night in Game 6. Amazingly, another round of playoffs meant another seventh game for Loschiavo. Three rounds of playoffs; 21 playoff games in his career. Unfortunately for the Warriors, their title pursuit came to a screeching halt in Game 7 when they were defeated, 6-0. 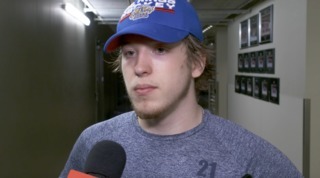 It was the final game he’d play for the team, as he was acquired by the Oil Kings in May, 2018. And that’s what 300 games in the WHL is. It can be exhilarating, exciting and satisfying in the good times. It can also be agonizing, raw and heartbreaking in the bad. But throughout both it’s a brotherhood forever, and it’s unforgettable memories that will last a lifetime. As much as he values all the coaches and teammates who have been a part of those 300-plus WHL games, he knows he couldn’t have learned all the lessons or made any of the memories in the first place without the help and support of his family. “Family is definitely a huge part of why I’m here and how I got to where I am today,” he said. “They’ve supported me in everything, but they never pushed me too hard. They say time flies when you’re having fun, and Alison Loschiavo says the expression makes perfect sense when it comes to her son. 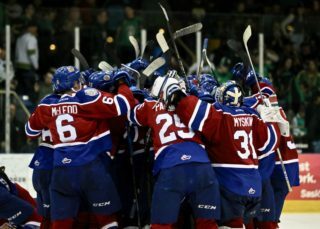 “I can’t believe how fast this WHL experience has come and gone,” she said, “so I can only imagine how it feels for him. “I also realized it is a true blessing to have something you care about so much; a true passion.